One of my biggest musical regrets is that I missed being able to experience the music of many great Cuban artists during some of their prime years, due solely to politics. One of those artists is Chucho Valdés. However, even though we’ll never get to really hear what Irakere was like in their prime, we can be thankful that Chucho is still very active at 71 and creating great music. His latest album, Border-Free (with a group that he calls The Afro-Cuban Messengers, in a nod to the jazz finishing school that was Art Blakey and the Jazz Messengers), is a deeply personal statement, filled with tributes to his family members and others who have influenced his musical direction. But you never forget that this is a Chucho Valdés album, so these tributes are carried out in the midst of killer Afro-Cuban rhythms and piano statements of astonishing brilliance. Like Blakey’s Messengers, Valdés’ Messengers are comprised of impressive young musicians who are making a name for themselves, in this case in the Afro-Cuban jazz idiom. This is another reason that I hope that the climate between the U.S. and Cuba continues to thaw, so that we can hear more from these five brilliant Cuban youngsters. In addition, Valdés adds a “ringer”, as Branford Marsalis guest stars on three tracks. The album’s title is a reference to the fact that Mr. Valdés made a conscious effort to make this more than just an Afro-Cuban album. The idea was to find rhythms that could be fused with those of Cuba to create something fresh and intriguing. One of the best examples of this effort led to the most impressive track on the album, “Afro-Comanche”. In the 19th century, a group of about 700 Comanche were taken prisoner during fighting with the Spanish Army, in what we now know as Texas. These Comanche were relocated to Mexico, then Spain and eventually Cuba. Many died from the conditions and the unfamiliar climate. Many of those who survived mixed with the Afro-Cubans and started families. Their children were known as “Afro-Comanches”. On this cut, Valdes begins with an opening on piano that employs traditional Native American musical elements. He then continues to state the theme, while Afro-Cuban rhythms are added. After a strong solo by bassist Ángel Gastón Joya Perellada, Valdés returns in 4/4 with a hard bop statement, raising the tension to the breaking point before he drops out, giving way a purely African drum solo by Dreiser Durruthy Bombalé on the batás, which leads to a call and response chant, wrapping up as Valdés blends in again to restate the theme. “Afro-Comanche” is twelve of the most exciting musical minutes that I’ve heard this year. I have to admit that I could not (and still cannot) stop listening to it. “Tabú” is another standout. A tribute to Margarita Lecuona, the composer of “Babalú Ayé” and other Cuban classics, this mid-tempo track is notable for Marsalis’ cool tenor work and the impressive trumpet solo of Reinaldo Melián Alvarez. “Bebo”, in honor of Chucho’s late great father, who was also an outstanding pianist, has an insistent melody line that stuck in my head immediately. It also featured more excellent trumpet from Alvarez and tenor by Branford. What’s most impressive though is Valdés’ solo. On the spot, he decided to play a tumbao in his father’s style with his left hand, while soloing with his right hand in his own style, resulting in something that sounded a bit like Chucho and Bebo playing together. It was nicely done and very moving. “Pilar” was written by Valdés for his mother, who loved Bach’s preludes and fugues and Miles’ “Blue in Green”, so Chucho gives us a bit of both in this introspective piece, which kicks off with a striking bit of bowed bass work by Perellada and follows with Valdés reaching deep into his Bill Evans bag. Border-Free is another triumph for Chucho Valdés, from concept to execution and all points in-between. Though it sounds clichéd, I can’t think of a better way to say it; Chucho just keeps getting better with age. 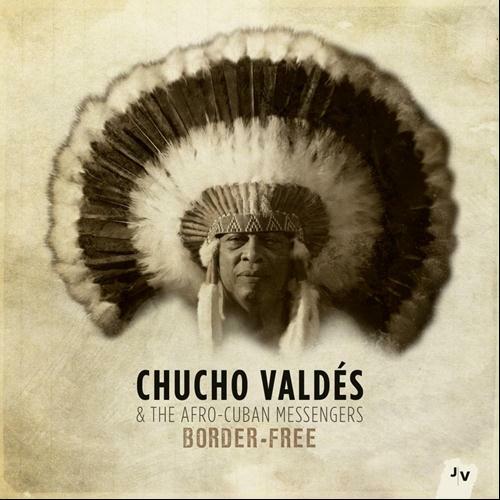 This entry was posted on July 9, 2013 at 9:13 am and is filed under CD Reviews with tags border free, chucho valdes, latin jazz. You can follow any responses to this entry through the RSS 2.0 feed. You can leave a response, or trackback from your own site.